And the Hard Rock trailblazers from Finland are back for one more round. 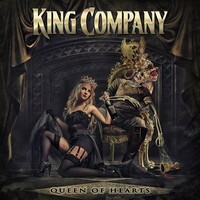 Yes, KING COMPANY returns, and let me tell you a thing: if you liked their first album, “One for the Road”, you’ll love their latest and second blow, “Queen of Hearts”, this one we will talk about now. Their lineup had a change: the vocalist Pasi Rantanen left the band, but the Italian-Argentinian singer Leonard F. Guillan is doing a great work as well, and the rest of the band is the same experienced musicians that played on names as CHILDREN OF BODOM, THUNDERSTONE, KOTIPELTO, ENFARCER and others. And their music evolved: their musical work based on a Hard Rock insight is the very same from “One for the Road”, but now, it’s filled with some AOR aesthetics, to turn their music even more tasteful and able to reach a broader public. So be prepared, because the charming melodies and hooking chorus are back, just with a more elegant and accessible outfit. The quintet took the responsibility of the production on their hands, and they did the right thing: the sonority of “Queen of Hearts” is really excellent, with fine instrumental tunes (that are matching on their musical work), and a perfect balance between weight, aggressiveness and clarity. Everything seems to be worked on a way that the only result acceptable was to be as perfect as possible. When the album starts to play, we have the clear idea that the quintet worked truly hard on the writing process, because I can’t see a weak spot on “Queen of Hearts”. All the songs are excellent, but I recommend you to pay attention on the fine combination of weight, melodies and aggressiveness shown on “Queen of Hearts” (excellent chorus and vocals), the catchy energy of “One Day of Your Life” (bass guitar and drums are great here), the fine blend of accessibility and weight shown on “Living in a Hurricane” (it’s impossible to not like these guitars), the commercial scent that comes from “Under the Spell” (this song would play for weeks on the radio stations on the 80’s), the hypnotizing tempos show on “Learn to Fly” (very good keyboards parts, creating a tender and melodic atmosphere), and the introspective touches that make the keyboards parts sounds really nice on “Arrival”. “Queen of Hearts” is really an amazing album, so listen to it as loud as you can!